Earthquake Resistant TMT Bars ? Why do buildings generally collapse when earthquake happens? During earthquake the vibration of the ground causes the foundations of the buildings to shake, because of which the portion of the structure above the foundation which are not capable to bear the jolts will collapse. It is a well accepted fact that we cannot stop or avoid any natural disasters like earthquakes, tsunami, fire attacks etc. from happening. However, with today’s developed technologies, we can always use some safe construction strategies which can save our lives from disastrous natural calamities. As engineers say “earthquakes don’t kill, but the constructions built poorly does”, it’s not the earthquake or those strong jolts that cause most injuries and fatalities, but it’s those structures which are brittle. It is all with the construction materials used and key factors that one should consider to build the safe constructions. That one key factor according to the industry experts that can bear and withstand the effect of these disasters better is using a better quality TMT bars. In order to build an earthquake resistant building one has to construct the building with more of a ductile property. 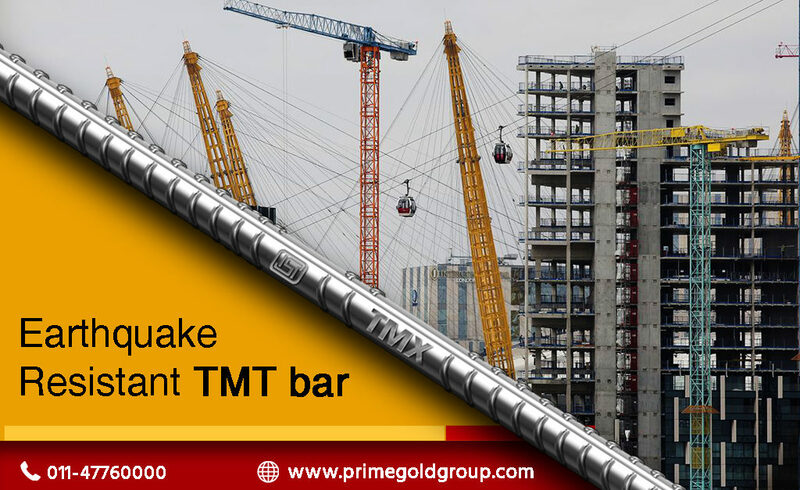 TMT steel bars play a very critical role in increasing the ductility of buildings. Many think that cement is that key factor which gives strength to the structures which is partly true. The real hero badge of the construction industry goes to TMT bars which are considered as a chief construction element which bears the entire weight of the structure. Primegold International Pvt. Ltd. which is leading the construction market manufactures the top rated greater quality TMT bars. Their TMT bars have the wide array of features which offer you long lasting structures like earthquake resistance, thermal resistance, corrosion resistance, high ductility, and bendability and elongation properties.